Kotobukiya gives fans a delightful preview of another Capcom/ Street Fighter product in the form Street Fighter’s Ibuki! A Kotobukiya Japanese import! Kotobukiya continues its hit line of incredible Street Fighter Bishoujo Statues, adding another beautiful lady to the current collection including Cammy, Chun-Li, Poison, and more. 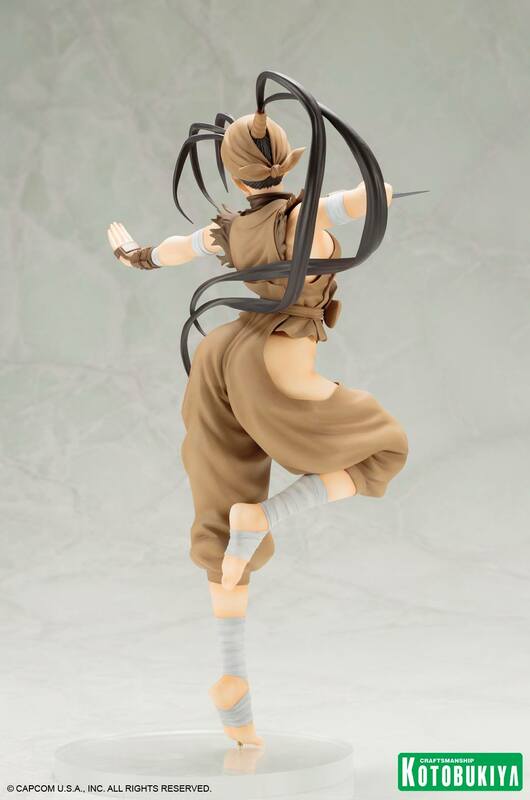 Joining the fight is the young ninja who made her debut in Street Fighter III, IBUKI! While she goes to school like a normal girl, Ibuki is secretly the scion of a secret ninja village with amazing martial arts skills. She excels in taijutsu which borrows from a number of fighting styles including ninjutsu. Now the ninja girl is coming to you like never before in a fantastic Bishoujo Statue presentation based on an all new illustration by Shunya Yamashita! Spinning into battle, Ibuki fights wearing her signature outfit and with a smile on her face. The ninja’s unique take on a traditional “dogi” consists of a loose-fitting brown garment designed for mobility; there’s a sleeveless top and short baggy pants connected at the waist, and large open sections offer glimpses at her athletic physique. Ibuki accessorizes with white wrappings on her legs and arms while the brown cloth returns on her wrist guards and the head wrap that ties her long black hair into flowing tendrils. The fighter is captured in a fantastic action pose, balancing on the toes of one foot with the other tucked underneath her. Ibuki leans forward and twists to her left with that hand outstretched in front of her and the other holding a shuriken at the ready! Despite the fierce pose she even has a cute smile on her youthful face. Sculpted by Hogarii (Jetstream), Ibuki stands just over 9 ½ inches tall (1/7 scale) balanced on one foot on her specially designed display base. 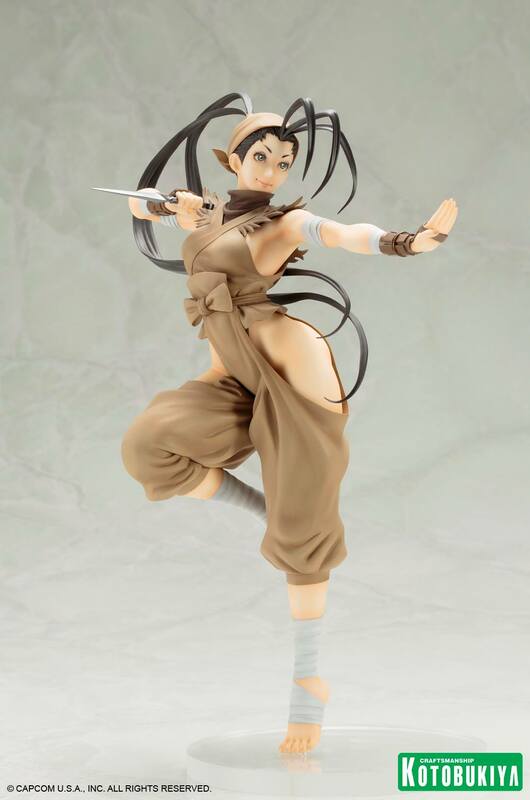 Get this ninja fighter for your collection and display her alongside other Kotobukiya Street Fighter Bishoujo ladies! 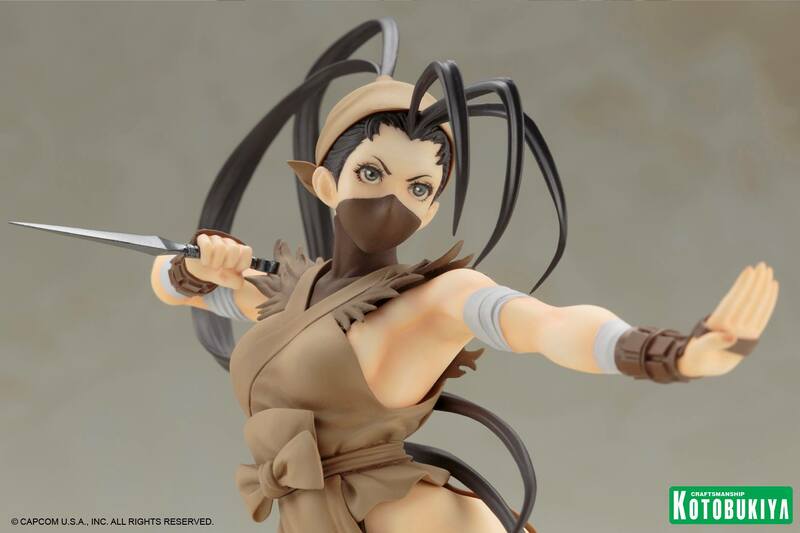 According to an update, Pre-orders from Kotous or official Kotobukiya stores in the US will also bring give buyers an extra accessory for Ibuki, that face mask she wore when she initially debuted in the franchise.